"A quick and easy salad that is great for any occasion. This cool, shimmering treat makes a wonderful dessert, too." In a large bowl, mix the cherry pie filling, sweetened condensed milk, crushed pineapple and whipped topping. Chill in the refrigerator at least 2 hours before serving. 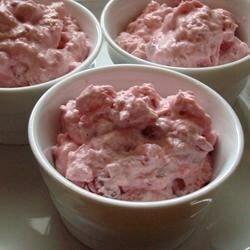 Substitute the condensed milk for fat-free, light cherry filling, and light cool whip and you have a low-fat treat. YUM YUM YUM!!! this is so easy - and it tastes even better if you add about a cup of pecans to it! Very simple to make! Just keep in mind that it has to chill in fridge at least 2 hours! It is perfect the way it is, but I like too add 1/4 cup coconut, and 1/2 cup chopped pecans. Great Recipe ! Everyone loved it !! Pink color looks very festive for taking to parties and everyone will ask you for the recipe! THIS IS THE BEST! What a simple recipe for the BIG reward it gives in amazing flavor and satisfaction! I take it with me whenever I need to bring food to a gathering!